Imagine a world in which drinks didn't spill at all - not in your diaper bag, not on your nightstand, and not even onto your eager-to-learn child. 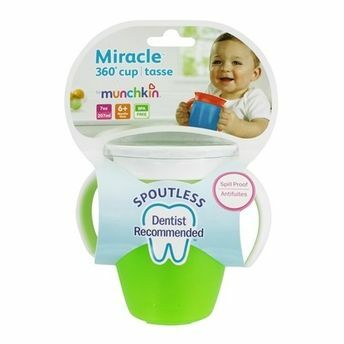 No, It's not a miracle, exactly - It's Munchkin's Miracle 360 Degree Cup. The first sippy cup invented with both parents and kids in mind, the Miracle 360 Degree Cup eliminates messes and supports kids' dental health all at once. Drinking from anywhere around the rim, like a regular cup, helps support normal muscle development in a child's mouth. And with no extra spouts, straws or pieces, the Miracle 360 Degree Cup is easy to use and even easier to clean. Explore the entire range of Feeding and Nursing available on Nykaa. Shop more Munchkin products here.You can browse through the complete world of Munchkin Feeding and Nursing .